Cree from the James Bay community of Waswanipi are vowing to keep up pressure on the Quebec government to protect a vital piece of virgin forest near their community. 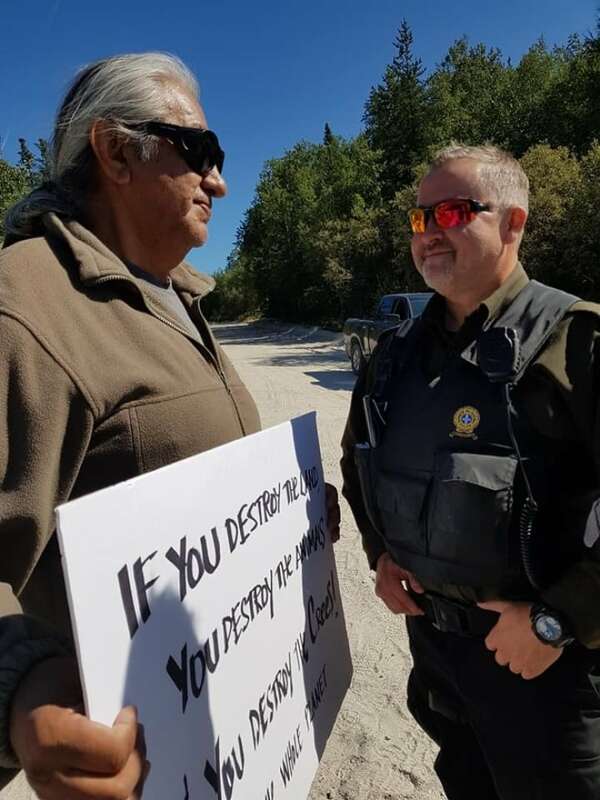 On Monday, Waswanipi tallymen — or Cree land stewards — set up a blockade and held a demonstration at kilometre 105 of the James Bay highway. 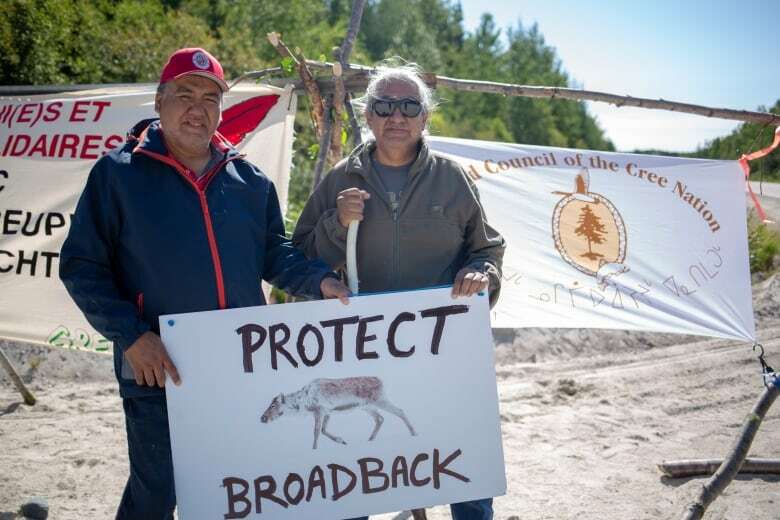 "We demand the protection of the Broadback Forest," said Sydney Ottereyes, one of the protesters and a Waswanipi tallyman. "We have been asking the Quebec government for 15 years, [the government] has not honoured its commitments to negotiate with us." 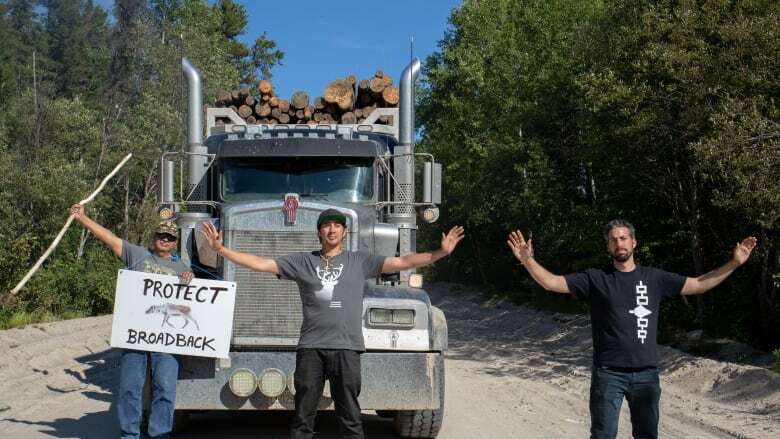 Members of Greenpeace were also on hand Monday at the blockade and have been working with Waswanipi Cree since 2010 to protect a vast tract of untouched forest in the Broadback Valley. It's an area they refer to as Mishigamish. Greenpeace says despite promising to negotiate an agreement, the Quebec government has released a five-year forestry plan that opens the area to logging. "The Waswanipi Cree have the right to protect their last intact forest," said Olivier Kolmel, head of the forest campaign for Greenpeace Canada. Kolmel says this area is the last 10 per cent of​ Waswanipi traditional land that is untouched by forestry and development and is a vital area to protect. "The forest is also our best line of defence against climate change," said Kolmel. "The last thing anybody should be doing is logging this special place. Securing a final deal to finally protect the​ Broadback must be an immediate priority of the next Quebec government." The area is also home to endangered woodland caribou. "It's very important," said Don Saganash Sr., another of the protesters and local tallyman. "I want my grandchildren and the next generation to see a woodland caribou. Please save the Broadback." In 2015 the Cree Nation Government signed a forestry co-management agreement with the Quebec government, but Ottereyes and Saganash say it didn't include their section of the​ Broadback River Valley. Saganash says he was pleased by the support they received from motorists on Monday, adding that the blockade was the "tip of the iceberg." He and Ottereyes are promising other action to pressure the Quebec government to act.